Before he went by Solomon, the stranger’s name was Shlomo. He seemed at first unremarkable, apart from being new, and in palpable need of a wife. Yutke’s mother began to snoop as soon as she noticed that he did not wear the tallis which marks a married man. “How do you know that?” asked Yutke. “And what were you doing, that you could see whether he was wearing a tallis or not? Were you peeping around the curtain, Momma?” A flimsy curtain divided the sexes, maintaining an old pretense that the sight of a woman would be distracting to the men in the sanctuary. Momma’s inquiries revealed that Shlomo had been born in a neighboring town, but had wandered near and far for the sake of his education. Nobody knew a thing about his family, or any prior connections. However, general agreement had it that he was a model yeshiva student and a burgeoning young scholar, and that proved enticing enough. Yutke would have protested her mother’s meddling, but she had felt drawn to Shlomo the Unknown, ever since she glimpsed him one day, hurrying past the market-going women with baskets on their arms, a pile of books in his. He did not notice her as he swept by, but he shed one piece of paper which drifted to settle upon his abandoned footprints. Yutke picked the paper up, only to find that it had nothing written upon it: only the ghost of bygone musings Shlomo had tried to efface, and the faintest sketch of an exotic bird bursting out of an egg, which glimmered through the page like a watermark. It did not occur to Yutke that she should be wary of a man who carried erasures of his own thought with him. Instead, she called after him, to give him back his paper. Shlomo thanked her much more profusely than her actions seemed to merit. He held her gaze a little too long, and heat flooded Yutke’s cheeks, although Shlomo did not have such looks as usually cause young women to blush. He was too thin, premature lines framed his mouth, and a lack of sleep had faintly purpled the bags beneath his eyes. But his irises were sea-colored, and as she stood before him, Yutke could see her own terror and longing reflected in silvery blue. She never dared imagine that such a new and otherworldly man could have any interest in young women of much more earthly stock — herself, least of all. And yet, Yutke’s family procured the match. She could not believe her luck, and persisted in disbelieving it, until after they were married. The raucous ceremony would ring in Yutke’s ears for days after the fact. Drums reverberated through the crowd, and trumpets bellowed. Yutke followed the musicians numbly as they led her to the square before the synagogue. The guests would murmur that she seemed a cold and listless bride, but they could not have known about the giddy upheaval churning her insides. The white expanse of canopy over their heads bucked and threatened to sail away on the wind. It looked blank, like it wanted to be filled by something. That vision of a white square would follow Yutke, repeating through time rather in order from cleanliness to filth: first the pure billow of canopy, then the starched tablecloths stained by the wedding’s abundance of honey and wine, then Shlomo’s ink-splattered letters from distant parts. She would learn to find the pattern meaningful. But she did not think about such things while she lay awake and peered at Shlomo sleeping beside her. She contemplated tracing the arch of his shoulder, but never did so. His days revolved around prayer and study. Yutke wondered what it must be like in his world of thoughts and words, instead of hers, full of dough to be kneaded and floors to be scrubbed. She had never known a man with so many books. The musk of aging paper thrilled her, although she would never be sure if she loved Shlomo for his piles of books, or loved the piles of books because they felt like part of him. Yutke had never recognized the chronic ache below her ribs as loneliness, until she married Shlomo. But, when rumors of military conscription drifted in from the nearest village, Shlomo wasted little time before disappearing again, and leaving Yutke with her ache. Yutke kissed Shlomo goodbye around his bramble of a beard. She would always remember him as he looked on that day: ankle deep in the spring mud, his frail figure comically imbalanced by the girth of a sheepskin coat. He and a handful of fellow wayfarers from the village stood in a circle, with packs of bread and smoked and salted meats slung over their shoulders. They said goodbye to their women, then vanished into the morning fog. Yutke cried furtively for days. She masked her tears by slicing onions when she had to (since her mother would not tolerate such moping). He had only just begun to feel real, and now he had disappeared again. But maybe it was better to let her longing fill his absence, since it was the ethereal scholar she had fallen for, not a man of flesh and blood. When the first letter from Shlomo arrived, Yutke had to refrain from reading it all day, while her mother busied her with chores. If Yutke tried to sneak off towards the letter, she would find herself in the kitchen instead, where she patiently draped ribbons of dough atop the noodle board, and did her best not to stare wistfully out the window. She wondered what kind of a writer her clever husband would turn out to be. After evening fell, Yutke sank at last into her chair with an oil lamp, and began to cut open Shlomo’s letter. Dear Yutke, she read. Today I helped to save a life! We had a distant encounter with a bear. The others fought over a rifle and disputed for a long time over whether or not to fire at the creature. I cited Vayikra 11:27 and said its meat would do us no good, but they protested that they only wanted to scare it, and would not listen to me when I tried to explain the passage further. However, while we were arguing over the matter, the bear trundled off. Will send more news once we come to the next town. Yutke let the note fall to her lap. She chided herself inwardly for expecting, she did not know what — a love note? Had she really expected that her husband the scholar would know anything about love notes, beyond what he read in the Song of Songs? She could not have known that it would become harder and harder to forgive Shlomo over the coming months, for writing letters which had less and less the flavor of love notes. As he travelled, he sent his bride scattered fragments of thought. He never gave Yutke anything that felt like real information, and she tried to guess and imagine the details he left out, while adding prayers to her workload as dutiful daughter and wife. During the wait between messages, she muttered tkhines for Shlomo’s health and happiness into a corner of the house, until her voice grew hoarse. One day, a new letter came. Yutke abandoned her chores to read it. She tore the letter open, and breathed in sharply at the first sentence: Yutke, I have some terrible news. But, her jolt of fear wilted into exasperation as she read on: At some point, while scrambling across the rocks, I have lost my toenails! And a couple of toes. I think we might at least call these lost things a toll to the Lord our God. And since the toll has been paid, He has at least allowed me a reasonably safe path. For this I am grateful. Would you bring this matter up with the Reb on my behalf? Did our ancient ancestors ever sacrifice their toes, instead of goats, to curry divine favor? Yutke reread the letter once more to make sure she had understood it. She had. And that was when Yutke decided it would be useless to chant any more prayers on her husband’s behalf, since she could think of none pertaining to the safekeeping of toes. He was probably just trying to make her laugh, so she would worry about him less. But Yutke would do what a good wife must: wait and worry anyway. At last, a real, substantial letter arrived! Initially delighted by the simple fact of its length, Yutke hesitated to read it through. She had a (correct) inkling that whatever news it contained would not sustain the fleeting lightness of her spirits, and so she clung to her wisp of hope and kept herself busy. After morning prayers, Yutke fetched water from the river, then plunged elbow-deep into the washtub while she scrubbed linens. As she draped the clean cloth over the line to dry, the white folds tantalized her, reminding her of the wedding canopy, and the piece of paper that awaited her inspection. Once she had rallied herself to the task of reading Shlomo’s letter, Yutke probably spent more time trying to root some sense out of it, than Shlomo had spent writing it in the first place. She read and re-read his words, and tried not to resent him for writing about all the wrong things yet again. My dear Yutke, he said, with all thanks to the Lord acknowledged, I must admit to you that I will not miss hiking through the mud, or the trains and control stations where they pack us like cattle, or the coldness of the gendarmes and doctors. But all of that is past now. Three days ago, at last, I made it to Hamburg! I would tell you it is beautiful here, but I’m really not sure if it is or not, for I think I spend too much time looking at the sky. The air is so open here, Yutke. Every day the sky has been white as paper, only marked by a few black flecks: birds, arranged like dashes, abandoned on a wordless page. Since I am a scholar, perhaps I should not be pleased by such barren writing upon the heavens. All the same, I do not think I have ever seen such beautiful prose. Empty things like that seem much more wonderful after you have spent too much time crowded against your fellow man, treated like a beast. Yutke put the letter down and peered out the window at the clouds. A couple of larks swooped in the distance. She made a valiant effort to see as Shlomo did, to read the birds upon the sky’s white surface as signs of something beautiful and ineffable. But no matter how she stared and squinted, the sky only looked like sky to her. Perhaps it was because she had not read enough books. Perhaps she spent too much time trying to read the wrinkles in the linens instead. Every step west seemed to take Shlomo upward as well, nearer the heavens, while Yutke found herself ever nearer the earth in the east, scrubbing away the dirt as best as she could. Nevertheless, she found herself glancing skyward. Yutke soon adjusted to the pain of waking early with a racing heart, and how that feeling would become a weight on her chest, once evening fell without any letter. So it went for many weeks. Yutke tried not to think too much about Shlomo as she noticed the world’s rebirth around her, as she wandered by the river, sucking the nectar from acacia blossoms. She went to market, milked the nanny goat, and always cleaned the house before the Sabbath, even when the child began to kick inside her. At night, Yutke occupied herself with knitting and sewing and waiting. Eventually, a small package arrived. It was stuffed to bursting with all the letters Shlomo had scribbled during his voyage across the ocean. They clung together like the leaves on a cabbage, and Yutke had to peel each message apart from the mass, and smooth it out with knife, to let it speak its piece instead of clamoring alongside its neighbors. There is a wealthy and rotten Englishman on board, who has established a nasty reputation for himself throughout the ship: even from below, we have often heard his booming voice complain about the service in the first cabin (on more than one occasion I have watched him toss lamb shanks and strudel to the fishes! ), and he is a known gambler, with an elaborately painted deck of cards, which he keeps atop a velvet cushion. Tired of his whining and howling, one day I howled back, and challenged him to a game of schnapsen — the stakes of the match: our respective seats in steerage and the first cabin! Out of arrogance the foolish Englishman agreed to play with me. And you will never believe this (but you must try): I trounced him, my dear, and earned myself a place in the first cabin! If anyone in the village does not believe you when you speak about my triumph, tell him that the Lord would of course favor a pious man over anyone who wastes good strudel. What’s more, as a parting trick, I pinched the Englishman’s queen of hearts. I will send you this card soon, once I can find the proper sort of case for it, so it will not be damaged during the voyage, and you will show it as proof to anyone who asks after me. It is beautiful, Yutke. The queen’s hair and crown glow with gold leaf, and she sits atop a marble throne upon a beach, the waters of a turquoise sea lapping up to kiss her feet. She holds a glittering heart-shaped goblet in one hand which rivals her crown for majesty. Yutke stared at the letter. “What in the world can you mean?” she asked. But the limp piece of paper would not answer her. Then she noticed that Shlomo — no, Solomon — had scribbled an addendum upon arriving in the New World, and securing his lodgings: P.S. When I get you a ticket, I will make sure you have a place in the first cabin. I rather miss it there myself now. Especially the fine cigars. And did you know what it is like to sink a silver spoon into a soft-boiled egg? Needless to say, Yutke did not know. She spent the next several hours rifling agitatedly through everything else her husband had sent her. She struggled to read in order, frightened of succumbing to Solomon’s mania, his collage of times and places. A strange feeling sat next to her fear, and if she had to name it, she would have called it anger — or envy, even. She had heard stories about the journey across the ocean. She had heard about the strange and terrible sympathy which could unite Russians, Germans, Irish, until they forgot they had no tongue in common. She had heard about the way they echoed each other’s sobs and moans, as though aware that the groaning ship had decided to drill them upon the paradigms of a universal language known as nausea. Under similar circumstances, would Yutke dare even dream of the taste of a soft-boiled egg? Yutke sorted a sequence of letters into a roughly chronological sequence (as though by doing so, she could also force her jumbled reactions into some kind of reasonable order too), and frowned at their odd progression from sunshine to shadows. The first few letters contained glittering tales of the golden New World, the next were about conquering its shadows, and the last looked to be all splattered over with ink. The pattern did not seem particularly auspicious. Yutke, began one of the golden letters, in the New World, all you have to do is run a sieve through the air if you want to collect the pulp of sunlight. There are light-pickers here who pass their days engaged in this very task, who weave the threads of gold they have gathered into glittering cloaks which can keep you warm throughout the winter (these will be perfect for the baby, I think). In another letter, Solomon described the local synagogue: … it is the most beautiful house of prayer I have ever seen, a marble palace, the aisles lined by purple columns, the façade marked by crenellations carved of coral, the ark studded with sparkling jewels. I have but one criticism of the place: the stained glass consists only of various shades of gold, which I find very tiresome by now. As she read, Yutke sometimes checked her fingertips, just to make sure that no gold dust clung to them like pollen. Instead, she found only dust and faint traces of ink. One of Solomon’s darker letters had sprouted a strange inkblot creature, a scribbled beast with skeletal wings and a long sinuous tail which snaked around his words. In the lower left-hand corner of the letter, positioned as though it wanted to escape to the next page, a slug-like splotch of ink seemed to quiver. At the top of the page, Solomon’s hand cried out: Yutke, look what I encountered recently! As it turns out, while the sunshine in the New World is made of solid gold, so are the shadows made of ink. Sometimes, where the dark boils beneath the streets, it convinces itself it is alive. This is how I recently met a dragon composed of ink and shadows, while I explored underground after morning prayers. I tore its tongue out after I slew it, as a token of my victory (since the entire dragon’s head would have been too heavy to take away). I will wrap its tongue up in this letter (but I am afraid it might melt back into a puddle of ink during the journey across the ocean, for which I apologize in advance). Yutke realized that the slug of ink was supposed to be a dragon’s tongue, flattened by its paper prison. She stared at it, but she could not read it as a tongue, any more than she could read punctuation into the sky. The more she looked, the uglier the sign seemed, and it took a great effort to refrain from tearing the thing up on the spot. But Yutke found she could not damage or toss away anything that felt like a piece of Solomon, however much it repelled her.The next letter was so riddled with streaks and specks of ink that the promise of a headache pulsed across Yutke’s temples at the mere sight of it. Solomon had stitched his words so closely together that they seemed less like sentences than jagged scars of ink. The first scar read: Yutke, I am afraid I did something very silly last time I tried to write you. Yutke’s hand trembled as she began to trace the next scar of a sentence, willing herself to understand. Picture me: I was sitting awake at night, as I often do, in order to write. I keep a kerosene lamp on my desk for just that purpose, and two bottles sit by my elbow: one of ink and one to drink. Last evening, I happened to be so caught up in my work, that I was stupid, so stupid, and reached out blindly and seized my ink bottle! I did not think about the missing whiff of schnapps. But instead, like a fool, I raised the vessel to my lips, and drank. Nobody helped me, when I said I had swallowed my ink. But I did not hush. “I drank my ink,” I told them. The shadows answered that they knew I would mix the damnable bottles up, then told me to go to sleep. “That’s enough foolishness for one evening,” they said. And so, I began to prepare for bed. But I was so dizzied by this whole mess, that when I reached to put out my lamp, I knocked over the rest of my ink, and it flooded the letter I was writing to you! It irks me that you won’t hear of my latest adventures. But I suppose the dark has its right. It seems just that it should consume something of mine, after I have had the gall to consume it. Yutke, I am so tired. Yutke put the letter down and stood up. She paced back and forth. She wanted to go and touch her husband’s books and inhale the scent of old paper — but she had already been obliged to sell the tomes he had left behind. The floorboards creaked beneath Yutke’s restless feet, and her mother yelled for her to settle down and get some rest. Eventually, dizzy with the effort of understanding — or rather, the effort of relinquishing the will to understand — Yutke obeyed. That night, she dreamed of a poplar with messages scratched into its leaves, which fell about her feet in haphazard piles, according to the whims of the wind which rustled through the tree’s branches. Every time Yutke picked up a leaf to try to decode its message, the wind whipped it away. She woke up, and knew she could not wait any longer for Solomon to send for her. When we first saw the torch-bearing statue, I almost expected to see her torch flicker with golden flames. I thought, perhaps you did not lie about all the golden things. But we came at dawn, and had to proceed through a thick mist. Even if her whole body had been forged of solid gold, I am sure we would hardly have seen a glint of it. My fellow passengers all tossed their hats in the air when we saw her. The people were being very loud, and they upset Moshe. He kept fretting and rubbing his face into my blouse and I had to rock and kiss him so he would not cry. The ship’s doctor told me that in America they would be very wary of people who have anything wrong with their eyes, and I did not want Moshe’s to be red at all. I felt a little angry, if I am honest. I wanted to rub sea salt in my own eyes until they turned red and raw. I thought, doing something like that would be like sticking my tongue out at this place and its ridiculous rules and promises. You did not tell me it would be like this, Solomon. You made me understand that you have to die a little to get into the New World, it’s so much like Paradise. I imagined, it would be a painful process — shedding the egg shell around your soul — but you get through it. And yet I’ve found that this is not true. Nothing ever gets easier. The world wears you down more and more, until you disappear. You disappeared. And I have tried to reinvent you out of paper and ink, like you tried to reinvent this place out of paper and ink. But it’s not working. Yutke never would have sent this letter, even if she had known where to send it. Instead she drew a long slash across it, and turned the page over to be reused. Later in the day, she was bathing Moshe in a kitchen basin, when she noticed a birthmark on the inside of his wrist. She had never seen it before: a strange shape, which you might easily mistake for a tiny, dark slug crawling across his skin. Yutke held Moshe’s little hand until he began to squirm and pull away. He promptly stuffed his fingers in his mouth. The boy’s name was Moshe (or Moses, in this new country), but sometimes Yutke called him her little moshl, her fable, since it did not take a prophet to foresee the boy’s fate. Like his father, he would be a messy, walking story, leaking fibs and tales whenever pen and paper came in reach to do so. After drying off Moshe and settling him atop a blanket with his wooden horse, Yutke sat down at the table with a pen in hand and spread out the blank verso of her previous letter, wondering what she could say to whatever was left of Solomon. She did not quite realize she was crying, until the page began to buckle beneath her spreading teardrops. Frustrated, she rubbed at her eyes with her apron. What a waste of good paper. These days, Yutke always kept a playing card in her pocket, which she caressed sometimes for good luck. It was a beautiful thing, emblazoned with a scarlet queen whose crown glittered with a trace of gold leaf. Yutke touched its rounded corner, and thought of her husband. She was beginning to lose the details of his face. She understood now that he was a permanent exile and a palimpsest of a man, easily effaced and rewritten by forgetfulness and memory in turn. It often seemed to Yutke that she had only ever known him as meandering scrawl, a landscape of splattered ink — not as a person, much less as a husband. She could not fix the idea of him in her head. But if she tried to recall the lines framing the corners of his mouth, and his eclectic piles of books and notes, she could almost grasp a thread to follow through the labyrinth of his logic. I find myself missing you, although I barely knew you. I miss waiting to hear from you. I even miss when the wait seemed to be crushing my chest. I often feel like I am still waiting, and it is difficult to persuade myself that this is no longer the case. The memory of you is like an impression in wax; it wants to be filled by something, but it has been melting away beneath this city’s sun instead. You did a poor job of slaying that demon, the thing you called a dragon. Did you know that the beast traced your journey backwards, following your scent, until it found me? It haunted me and slithered around my belly and gave me a great fear it would infect the baby (which, I think, it has done). But at last, I realized that you cannot kill a dragon, nor can you cover it over with glittering things to hide it. You have to tame it. So I gave the creature a good scolding whenever it was unruly, and if it behaved very poorly, I would whack it with a broom until it fled into the garden. This went on, until the dragon bowed its head meekly before me, and even dropped onto its belly and permitted the baby and me climb onto its back. That is how we flew across the ocean, astride the tongueless dragon composed of ink and shadows. Now we live on our own little island on the East River — the baby, the dragon, and me. I keep a golden bell upon my bedside table and ring it whenever I want tea or a pastry, and the dragon trots in with a platter balanced on its back. When Moshe is grown, I will teach him how to tame and control the dragon as well. He will have gifts from us both: thanks to you, he is marked by the dragon’s tongue, and he will learn to write with it. And thanks to me, the beast will never overwhelm him. I miss you, Solomon, and I would wish you the best if I could. Yutke put her pen aside, and sighed. Well, this one would not do either. It took her a moment to realize that her attempt at channeling Solomon’s kind of nonsense had changed something in her gaze. Tears had ceased to blur her vision. When she glanced at the shadowy doorway, she did not see the dust and the patched coat which hung forlornly from its hook. Instead, she could almost see a serpentine figure entwined with the dark (and if Yutke squinted, it even seemed to be accompanied by a ghostly tea set which shimmered in and out of view). “Oh,” murmured Yutke. She averted her gaze. For the first time since Solomon had begun to write, pity welled up in her — not for herself, but for him. She folded the letter neatly, and went to the fire escape, where she stood and watched the bustle below: peddlers and women with baskets, horses drawing carriages and wagons loaded with wares, men with hats tilted over their heads so she could not see their faces. If Solomon were to pass by, she would never know. Why had he even married her, plain and unsmiling as she was? Why had he treated her like a mirror, always writing letters to her which seemed like pages torn from a madman’s diary? Yutke felt the breeze tug at her skirt. It stirred the clothes draped over the iron railing. 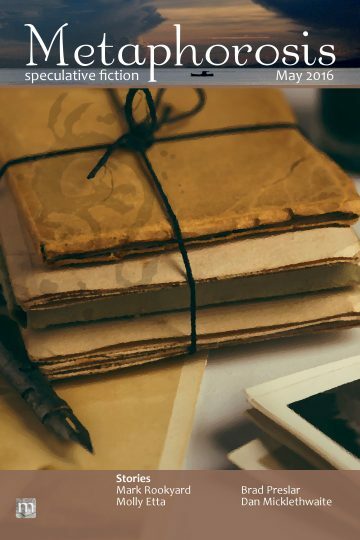 She clutched her letter tightly, then pried her fingers away from it one by one, until it drifted away down the street, buoyed along by the air. She watched her letter glow in the sunlight, until it disappeared from view, and then she went back inside. Yutke did not bother glancing toward the doorway, to see if the dragon still lurked in the shadows. It would not do to raise the hopes of the poor creature which had eaten her husband alive. It would have no such luck with her. Illustrations and the dragon on the cover image are by the author. This really lovely. Thank you. The language and the story are both beautiful. Well done!